Performing control while changing the set point temperature moment by moment is called running a program pattern (or simply running a program). Sterilization and pasteurization require maintaining specific temperatures for specific durations. The UP55A/UP35A Program Controllers not only control the raising and lowering of temperature, but also let you create programs that can reliably maintain achieved temperatures for specific lengths of time regardless of weather-influenced outside temperature fluctuations. 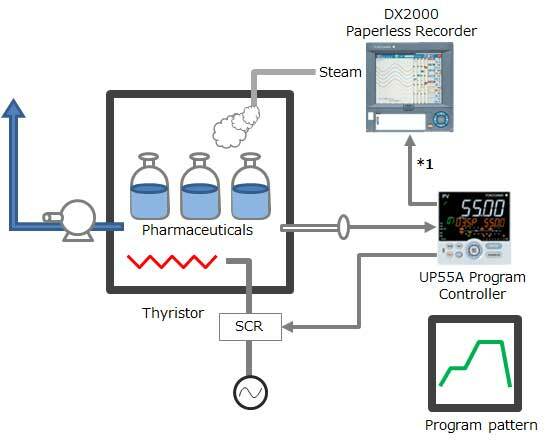 The UP55A/UP35A Program Controllers have many program patterns, and can therefore be switched according to the type of pharmaceutical. One program pattern consists of multiple program segments. The time to pass through each segment is specified with a segment time or a ramp. You can specify program pattern repetitions or start/stop, and status output (event output). *1: PV transfer to the recorder is possible with a 4-20 mA signal, or digitally through communication. The UP35A is a program controller with available 4 patterns and 40 segments (max.) and multi-channel contact I/O. It also includes a ladder sequence function. The UP32A is a compact program controller with up to 4 patterns and 40 segments available. It also includes a ladder sequence function. The UP55A is a newly-released 1/4 DIN sized program controller provides up to 30 program patterns, and simultaneous monitoring of 8 PV events, 16 time events, and 8 alarms. Also a ladder sequence function is included as standard.